Image resolution is very important in the printing industry. No one likes to see their printed images pixilated or blurry (fussy). Essentially, image resolution indicates the quality of the image when printed. Image resolution is described as DPI. DPI stands for (Dots per Inch). It indicates the amount of printable dots in the square inch of the image. More dots per inch – better the image quality when printed. 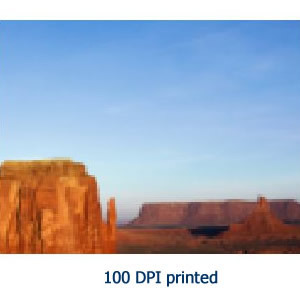 More dpi means more image information, which means that you can scale up image for printing. What is ideal image resolution for printing? For items that are viewed from the hand held distance (business cards, postcards, etc), the ideal printing image resolution is 300 dpi. For items that are viewed from the distance (wall posters, banners etc), the ideal printing image resolution is 200 dpi. How do I check the image resolution? Some graphic design software may indicate image resolution as PPI (Pixels Per Inch) which is essentially the same as DPI. You will need to refer to your software manual for more information on where it displays image resolution. You can also manually calculate out the maximum printable size of the image. Image width and height are indicated in pixels. So, for example in Windows if you can navigate to the folder where your images are stored and select the image, at the bottom of the window explorer you will see the image dimensions in pixels. Let’s say your image dimensions are 1024 px X 768 px and you would like to print it on your business cards. Now, we know the ideal image resolution for offset and digital printing is 300 dpi. To get the maximum printable size of this image, we need to divide image dimensions to ideal image resolution. So the maximum image size that you can print is 3.4” x 2.5” - which will be fine on your business card. But if you want, let's say, to print the same image as background on 5" x 7" postcard, you will loose the image quality. 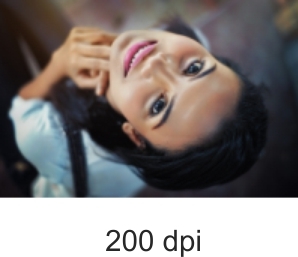 What does 200 dpi image look like? Below are rough examples of the image printed at 300 dpi, 200 dpi and 100 dpi. Again, those are rough examples and the actual results may vary based on image compression and other factors. What if I have 600 dpi image? Will it print better than 300 dpi image? If you have 600 dpi image it will be down-sampled to 300 dpi (350 dpi if printed on our HD offset presses). Technically, human eye can only register 300 dpi, so viewing 600 dpi image you will not see difference. But 600 dpi means that you can scale image up 2 times (then your image will be at 300 dpi) where is 300 dpi image you will not be able to scale up as you will start loosing the quality. What if I have low resolution images in my file? When uploading your files through our advanced file uploading tool, our system will check your file for low resolution images. It will also will notify if there are any low resolution images in the file at which point you can either re-upload file with better images or sign off on waiver to print file as is. On top of that, our file pre-flight team will perform the second manual check and will notify you if there are any critical issues with your images that may prevent printing your order. Please note that if your file have bad image resolution (below 150 dpi), our system may not allow you to upload file at all. Can I increase DPI of my low resolution image? You can only increase DPI by decreasing the image size (printing it a smaller size) or getting a new image with bigger dimensions. Let's say you downloaded your logo from your website and its size is 100 px x 100 px, which means you only able to print maximum 0.3" x 0.3" at 300 dpi. Some software like Adobe Photoshop, allows you to manually enter dpi for an image, in this case if you were to stretch your logo to 2" x 2" and manually set 300 dpi - that would be called as up-sampling the image. When up-sampling the image, you will still loose the quality and our file pre-flight system will not catch it and as the result you will get low quality printed images. We strongly suggest not up-sampling images in your file. Always work with original image sizes. Why on my screen low resolution images display perfect? Most of the computer monitors display at 72 dpi. Let's say we have image with dimensions of 300 px by 300 px. We know that for printing we require at least 300 dpi, so if we divide 300 px / 300 dpi = 1" we get the maximum image size we can print is 1" x 1". Now, if we take the same image and divide by 72 dpi which computer monitors support 300 px / 72 dpi = 4.16", which means than on the screen we can view the same image at 4.16" x 4.16" without loosing the quality. Make sure always to check image resolution in your design software or manually before printing it. Do not rely on how it displays on the screen.